November Karma Kit to one lucky winner! All you have to do is become a follower of the Scraps of Darkness blog and this blog, and “like us” on Facebook. Visit each participating blog, become of follower of those blogs and leave a comment. When you have visited everyone return to Scraps of Darkness and leave a comment letting us know how much fun you had! If you post about this blog hop on your own blog and let us know in your comment, you will be entered into the drawing twice for an extra chance to win! You have until Sunday November 18th at 1:00 AM PST to complete the hop. 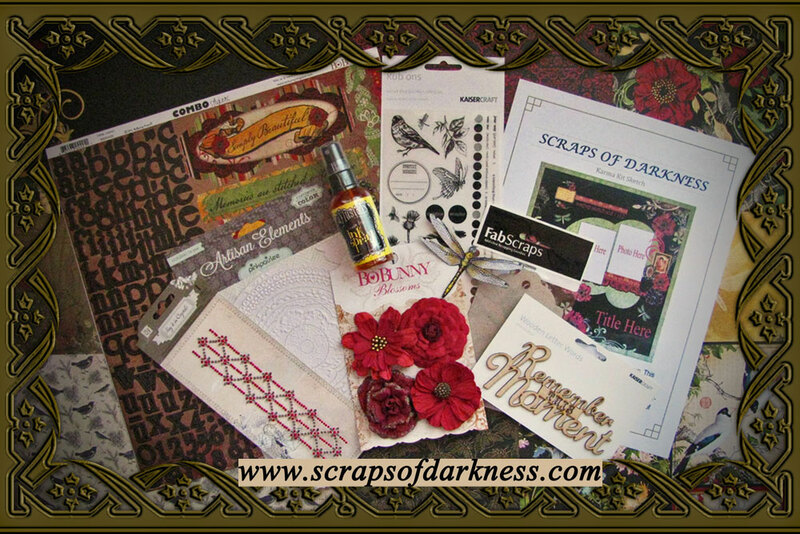 The winner will be announced on the Scraps of Darkness blog on Monday November 19th. Happy hopping and good luck on winning that fabulous prize everybody! I already follow your blog but I didn't know Scraps of Elegance had a Facebook page! I am now following that also! Love Love Love the new Scraps of Darkness kit..it's gorgeous! Oh WOW, What a beautiful kit!!!!!!! I just discovered you from the Bo Bunny blog... kit looks great! gorgeous kit and beautiful designs! Love this kit...I am now a follower. Looks like I will have lots of fun! Really loving the hop so far....all the projects are spectacular! Just starting the blog hop but if it is anything like last time, it will be full of inspiriation! Looking forward to seeing some awesome projects from this design team! I just started the hop. I can't wait to see all the awesome projects from the design team. Oh no... too late to win the prize but I am having fun on the hop!